Publication Information: Atria Books. 2014. 368 pages. Favorite Quote: "Love isn't an excuse for anything but treating someone well." "All these years .... I've been a prisoner of hope." That is what Maddy realizes about her marriage. She and Ben are married with three children - fourteen year old Emma, nine year old Gracie, and seven year old Caleb. Ben is a successful attorney, and Maddy is a social worker. Dominating their life is Ben's aggressiveness and anger. These traits make him a successful public defender, but they are destructive towards his family. Maddy has taken to pills to maintain an ability to cope. She walks on egg shells never knowing if, at any given moment, Ben will be the loving, committed man she thought she married or an angry abuser. The children too are "being trained in the fine art of placating an angry man." Essentially, their life is all about Ben and what will make Ben not angry. Maddy continues to make excuses, to focus on the positives, to take her pills, and to cope. Even that is not enough. One day, a combination of things lead to a terrifying and terrible accident. Fortunately, the children are not in the car, but Maddy ends up in a fight for her life. How the family copes is the crux of the story. The story is told through the alternating viewpoints of Ben, fourteen year of Emma, and Maddy. Ben's point of view, not surprisingly, is all about Ben - how the accident affects him, how it's not his fault, and how he will cope. Instead of worrying about his wife whose life is forever altered, he worries about himself. Instead of worrying about his children who are without their anchor in life, he worries about himself. He is a well portrayed picture of a self-centered, self-serving individual. Fourteen year old Emma is perhaps my favorite character in the book. Reading her point of view makes me wonder what happened to all the grownups in her life. Warranted, her father is worried about only himself, and her mother is in the hospital. What about her grandparents and her aunt? Other sections of the book show that the support exists, but from her point of view, she is floundering alone. She is thrust into the role of caretaker for her younger siblings. She tries a number of coping mechanisms - pills, boys, friends - but finds a way to be there for her siblings and to survive. She's the one you want to reach out and protect. Maddy's point of view is the toughest one to portray because you get glimpses into what life is before the accident and what it is after. Before the accident, I have a hard time understanding Maddy's actions. She is a social worker who should recognize the abuse in her marriage. She is independent and has a strong network of family and friends surrounding her. Why does she stay? After the accident, her actions are impacted by the accident and her relationship with Ben. The two, of course, run together as Ben is a big part of the accident occurring in the first place. Her confusion and injury make it difficult to get into depth as to her perspective. As a result, it is very difficult to connect with Maddy as a character. Since her journey is the anchor for the book, it makes the book a bit difficult to connect to emotionally. Maddy's confusion and the ending of the book leaves a lot of room to wonder what would you do in that situation. I do appreciate that the author does not try and wrap it into a neat package. Life is not neat, and this book does a good job of capturing the mess and the dysfunction. Unfortunately, with one main character who is not likable and one who is hard to connect to, I enjoyed the story but did not fall in love with it. Publication Information: Knopf. 2013. 496 pages. Favorite Quote: "She recognized in Kelsey that nationalism of liberal Americans who copiously criticized American but did not like you to do so; they expected you to be silent and grateful, and always reminded you of how much better than wherever you had come from America was." Americanah travels from Nigeria to the United States and back again. The story travels along three threads - the immigrant experience, the concept and understanding of race and culture, and a love story. Ifemelu is Nigerian. She comes to the United States to study and becomes an American. She stays for about 15 years. Then, she returns back to Nigeria and becomes an "Americanah" - someone who left and came back different. In Nigeria, Ifemelu is a young woman like so many others around the world - worried about school, loving towards her family yet embarrassed by them at times, and in love with her boyfriend Obinze. She grows up poor but is able to study at the university in Nigeria. From there, she is able to secure a scholarship to study in the United States. In the United States, she finds it difficult to find a job and difficult to understand all the cultural differences and racial divides. "It was the commercials that captivated her. She ached for the lives they showed, lives full of bliss, where all problems had sparkling solutions in shampoos and cars and packaged foods, and in her mind they became the real America." She find life to be full of difficulty and obstacles. She manages to find her way and create a life - a job, an education, a successful online blog, and loving relationships. Yet, she continues to feel herself different and sometimes unsure of who she is. "How can I just be myself? What does that even mean?" As a result, she abandons it all to return to Nigeria after living in the US for about fifteen years. Upon her return to Nigeria, she reconnects with her old boyfriend, who is now married and with a family. She again finds herself a stranger - an Americanah in this new Nigeria. To me, this book, more than anything else, is about fitting in and finding your place in the world. I don't think Ifemelu ever quite does that. She never quite commits to creating a fulfilling life in the situation in which she finds herself. Somewhere else and someone else always seems to hold more appeal to her. As such, I find myself getting frustrated with the character and wishing that she would let herself choose. This theme of being "different" carries through the rest of the book. Her aunt's is a mistress of a general; this sets her apart and different. Ifemelu's mother is on a constant search for a church where she will fit in. Ifemelu's boyfriend Obinze sometimes feels as if her does not belong in his family. His sojourn in England continues that feeling of not belonging. In the United States, Ifemelu finds herself not fitting in with the immigrant population or the "American" population even after living here for over a decade. On her return to Nigeria, she finds herself labeled an "Americanah" and still not belonging. Underlying this theme is the idea of immigration and of race and culture. Ifemelu's observations on the immigrant experience are enlightening. However, sometimes the kernels of truth get lost in the amount of detail in the book. For example, hair is a big part of her ethnic identity for her. The genetic differences in hair and the cultural importance of hair styles are a key for Ifemelu. Yet, does it really merit a description of several pages to make that point? I want to share in the experience but I don't want to wade through as much detail to find those "a-ha" moments. The love story - Obinze and Ifemelu - to me is completely unnecessary to the book. The premise of the book is Ifemelu's journey. Obinze goes through his own journey, emigrating to England, being deported, and returning to Nigeria to create what he deems a successful life. The immigrant experience and the experience of returning "back home" is sufficient to create a powerful story. The love story and particularly the focal point that it becomes towards the end of the book, muddles that main theme. I am still wondering why it is included at all. In a nutshell, the book has an incredibly strong premise. I loved its observations on the immigrant experience. I did not care as much about the main character or her love story. This leaves my overall reaction somewhere in the middle. Book Club side note: This book ended up being a a great book club pick. It led to many discussions about race, cultural and the personal experiences of our very diverse group. We had a reading group guide, but really, the book served as a jumping off point for conversations that went well beyond the book. Publication Information: St. Martin's Press. 2014. 256 pages. Favorite Quote: "Sometimes I get this breathless feeling that the war is a living creature, something huge with a pointed tongue and wicked claws. When the tanks rumble past in the far fields, I feel it breathe; when the air strikes start and the blood flows, I feel it lick its lips. I've grown up inside this war, so now I can't imagine what it would be like to live outside it." Sri Lanka is a small island nation in the Indian Ocean off the coast of India. Geographically, Sri Lanka is only about 25,000 square miles - a little bit larger than the state of West Virginia; its population in about 20 million people - about the population of the state of New York. The biggest ethnic population in Sri Lanka is the Sinahala. The largest minority is the Tamil. According to legend, the Sinhala claim to be descendants from the earliest settlers of Sri Lanka. The Tamil claim an equally long history in Sri Lanka. The two groups are divided religiously and ethnically. Sri Lanka became an independent nation in 1948 with the departure of the British control from the Indian subcontinent. Since that time, the relations between the Sinhala and the Tamil have been strained. Riots have occurred throughout the nation's short history, with the Tamil working for an independent homeland and the Sinhala working to keep government control. In 1983, the country went into Civil War - the government and army representing the Sinhala, and the Liberation Tigers of Tamil Eelam (the Tamil Tigers) representing the Tamil nationalist interests. The conflict continued for over 25 years until the Sri Lankan army defeated the Tamil Tigers in 2009. Over 25 years of civil war! Over 80,000 people dead! Island of a Thousand Mirrors paints a hauntingly vivid picture of this civil war. Told through the eyes of two young girls caught on opposite sides of the conflict, the book creates a personal story of war, destruction, and loss. The beautifully constructed narrative takes the reader into the hearts and the minds of these young women and the heartbreaking realities they face. Through the eyes of these young women, we learn of the war. We also learn a lot about Sri Lanka - the lush tropical environment, education, arranged vs. love marriages, economy, food, and such. The destruction of these becomes yet another victim of the war. Suicide bombers - "What could have led her to this singularly terrible end? What secret wound bled until she chose this most public disassembly of herself? Just moments earlier she had been just another nameless woman in the teeming crowd; now, blown to bits, she was either martyr or mass murderer, according to one's taste. Either way she had attained instant immortality. but what had led her to that moment?" Families destroyed - "The sound of pure and absolute anguish breaking out from each of us who has paid a price to the demons of war. A sounds forged in the lungs of the mothers whose sons have died unnamed in the fields, the fathers whose daughters have gone to fight." People who fled the war trying to explain the war to people in their new adopted homeland - "I try to explain. There are no martyrs here, It is a war between equally corrupt forces. I see their eyes glaze over. I realize they do not desire a complicated answer. They wanted clear distinctions between the cowboys and the Indians, the corrupt administration and the valiant freedom fighters, the democratic government and the raging terrorists. They want moral certainty, a thing I cannot give them." Yet, at the end of it all, the book ends on a note of hope. The losses are incalculable and inconsolable. Yet, hope remains. "When my weeping is spent, when I have no more sorrow to give, I shall celebrate peace. I shall wake up from these long decades of war and begin to see what we can do in peace, what sort of creatures we are when the mask of lion or tiger falls from us." The book is about the Sri Lankan conflict, but the emotions captured to vividly can be applied to the conflicts in the headlines these days. The author's words are truly universal. I know that the book, the story, the characters, and the narrative itself will haunt me for a long time to come. Publication Information: Broadway Books. 2014. 400 pages. Favorite Quote: "You just have to remind yourself of what's important. What's really important. I wanted her to be happy. That's what loving somebody is. It's not just the easy parts." Based on the description of this book, I viewed it as a quick, light summer read. Jonathan and Rosie have been a couple for many years; they have never seen the need to get married or have children. Soapie is Rosie's grandmother, a vibrant woman who raised Rosie. Tony is Soapie's young and handsome caretaker. Rosie breaks up with Jonathan and moves in with Soapie and Tony, only to find herself pregnant with Jonathan's child. Life gets messy, as it has a tendency to do. What choices will Rosie make? As I said, based on the description, it sounds like a quick read without much substance or depth - a perfect summer read. That turns out to true to some extent. The story ends exactly where I thought. The characters really don't develop through the story. Each one has one main character trait that is consistently displayed throughout. Yet, I found myself drawn into the story. The central theme of finding love - in the myriad of forms that it exists - brings cohesion and a greater depth to this story. The crux of the book is to depict love - what it is even when it differs from what you expect, what it is not, and how it can exist in different forms - through a variety of relationships. Take Rosie and Soapie's relationship. Rosie lost her mother at a young age. Soapie raised her. Soapie is not your typical warm and fuzzy grandmother; yet, she completely changes her life to provide safety and a home for Rosie. That is her expression of love even when it is not what Rosie thinks she needs or wants. Take Rosie and Jonathon's relationship. They have been together for years. They often profess their love for each other through their words. Do those words translate into loving actions? Is it love? Is it a true commitment? Or is it just a comfortable habit they have both gotten into? Take Rosie's relationship with her long dead mother. Since her mother died when Rosie was young, Rosie feels that love missing in her life. When she learns more about her mother's death, it raises further questions about that love and what it means for Rosie as an adult. Take Rosie's relationship with Tony. Is it friendship? Is it something more? Where lies the line between friendship and something more? What impact does it have on a relationship when both exist? Take Soapie's relationship with George. They have known each other for a long time and share a long history. At this late stage of their lives, they offer each other understanding, companionship, and love despite the other commitments in their lives. Take Tony's relationship with his ex-wife. They share a child and a love for that child. Is that enough to keep their relationship amicable? Can they put aside their differences for the sake of that shared love? Take Rosie's relationship with her baby even before the baby is born. Where does that fierce love and protective instinct come from? For an easy read, the book provided a lot to think about. Even though the story is told through one dimensional characters, the relationships in it draw me in, making me laugh and cry. Publication Information: Ecco. 2014. 416 pages. Book Source: I received this book through a publisher's giveaway free of cost in exchange for an honest review. The book was delivered through Edelweiss. Favorite Quote: "When you have truly come to know a person, Nella - when you see beneath the sweeter gestures, the smiles - when you see the rage and the pitiful fear which each of us hide - then forgiveness is everything. We are all in desperate need of it." Seventeenth century Amsterdam is a dark and gloomy place in this book. It is a world of the rich and the poor. It is a world of trade and greed. It is a world of mysterious characters and mysterious happenings. It is a world of strict social and religious rules. Nella is an eighteen year old country girl who steps into this world upon her marriage to a well known businessman, Johannes Brandt. The marriage has occurred with a bare acquaintance between the two. Nella is a stranger to Amsterdam, to the home and household of her husband, and even to her husband. As a wedding gift, Johannes presents to Nella a cabinet sized model of his - and now - her home. Supposedly, such a gift on a smaller scale was sometimes presented to children as "a practice instrument so she might learn to manager her larders, her linen, her servants and furnishings." However, Nella is no longer a child and has the actual home of her husband to manage. How then to understand the gift and what to do with it? Nella decides to decorate the model and seeks out artisans who may make miniature furnishings. Enter the miniaturist. She sees an advertisement and engages a miniaturist to make a few specific test pieces. She gets more than she bargained for. The miniaturist has an uncanny and unsettling knowledge of Nella's life and the "pieces" she may need. As the cabinet is furnished, so occur changes in Nella's life and household. The book has a promising start with hints at the mysteries to come. It has somewhat of a dark, Gothic, supernatural feel to it. Johannes is this mysterious character, who gets married but seems not to have much time for his new bride. The other people in Johannes' household seem to have secrets of their own. The house and its miniature model seem ominous. The weather is cold and damp. Nella has the feeling of being watched and the feeling as if there are secrets she ought to know. Unfortunately for me, I guessed the ending of the book fairly early in the book. I cannot point out what led me to the guess, but I did guess correctly. That dispelled some of the buildup and mystique of the book. As the book progresses, it also becomes less and less about the mysterious and the supernatural. Rather, it comes into the every day world of individual choices, social norms, and relationships. The mystery of the miniaturist becomes a vehicle for Nella to learn about her husband, her home, and her new life. "I thought she was stealing my life, but in truth she opened its compartments and let me look inside." By the end, I am not sure what the purpose of the miniaturist is. The character is never really developed with a back story or a resolution of what happens to her. How then to describe her role in the book? Nella's story and the story of her new household could have been equally successfully told without the somewhat supernatural element. The historical context of the Dutch trade and strict religious edicts along with the introduction of someone new to both was a strong enough premise on which to build the entire story. Was the miniaturist really necessary? Publication Information: Grand Central Publishing, Hachette Book Group. 2014. 223 pages. Book Source: I read this book because I have enjoyed the author's work in the past but have not read one of her books in a long while. Favorite Quote: "I do believe that each of us slept the whole night through without our real lives interrupting our dreams." The Girls of August should probably be titled The Mean Girls of August. That is how the book reads. The "girls" are Maddy, Rachel, Barbara, and Melinda. They met and became friends years ago. They spend a week together in August every year. It started on a whim, but became a longtime tradition between the friends. However, Melinda passed away, and the girls of August have not met in a while. And now comes the introduction of someone new - Baby has married Melinda's husband. She offers the August girls the use of her island vacation home for a reunion. They accept the vacation, but are much less accepting of Baby. The open minded view says that the other three women agree to the vacation because they are willing to give Baby a chance. The cynical view says that she offers them a private island getaway, and they decide to enjoy it despite her. Baby starts off with many strikes against her. She is lovely, young, and enthusiastic - more so than the other three. She is new to the group. She has taken over the place, that in the mind of the other three, belongs to Melinda. The other three have a lot of history with her husband, which transfers to their relationship with her. All four women come to the island with their own secrets and their own heartaches. Yet, Maddy, Rachel, and Barbara all gang up on Baby and essentially behave like sophomoric mean girls. The problem is that these are grown women with life experiences, families, and careers - they should know better and they should behave better. This book is short at only a little over 200 pages. The story is rushed and not much of a story at all. The mean girls unite against the new girl. New girl perseveres. Repeat. Repeat some more. Insert some big melodramatic events that may or may not change relationships. Repeat. The end. That's it. The book is melodramatic from beginning to end. The problems that the girls bring with them are predictable - mourning, illness, marriage, children. The reactions are also expected - anger, alcohol, and resentment - and described at a very shallow level. The characters are really undeveloped. In fact, the characters of Barbara and Rachel are such that I had trouble keep them and their problems straight. In their wallowing and meanness, all three of the "girls of August" are not particularly likable. My favorite character of the book, perhaps, is Baby. Her position of being the new one in a group and of trying to create friendships is perhaps the most interesting especially since the other three have such a strong bond and have been through so much together. The quote from the book movie Dirty Dancing, "Nobody puts Baby in a corner," runs through my mind, but in this book, Baby is definitely in a corner. Unfortunately, the book never shares her perspective or develops her background or personality until the very end. By then, I want to know more about her, but the book ends. I have not read a book by Anne River Siddons in a long while, but I do remember enjoying the books. I remember the stories and the characters having some depth and a lot of warmth. This one has none of that. A disappointing re-introduction to the author's work. Publication Information: HaperCollins. 2014. 256 pages. Favorite Quote: "He cannot keep all his memories and survive." 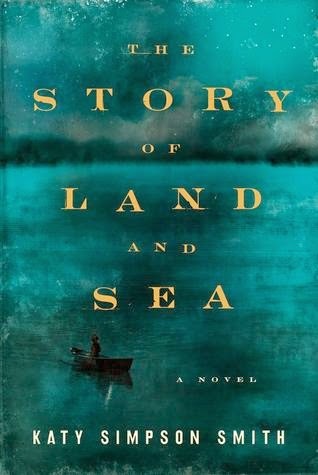 The Story of Land and Sea is a story of the parent-child relationship and of loss. It takes on the challenges and the heartaches of parenting but not the joys. The story is set in a small coastal town in North Carolina at the time of the American Revolution. John runs a small store in the town but is a man of the sea. He was a sailor and a soldier, but settled down on shore upon starting a family. He is father to ten-year-old Tabitha, alone since the death of his wife Helen. Tabitha is raised on the stories of pirates and the seas. John takes to the sea again when Tabitha falls ill. He hopes that the sea will bring her joy and health as it did to his wife. This story and parent-child relationship is the least developed of all. Perhaps because of her age, Tabitha is a feature in the story, but not a complete character. This part of the story is about the struggle to raise a young child alone, the lengths to which you would go to protect that child, and about devastating loss. Asa is father to Helen. He is the owner of a plantation, and raised Helen alone after the death of his wife. Throughout Helen's childhood, he has dreams of her life and of their life together. He heartily disapproves when she takes up with John. The story of Asa and Helen is about the changing relationship between a parent and a child as the child grows. It is the story of what happens when the needs and wants of the parent and the child are not the same. It speaks of the disappointments and heartaches parents undergo because of the decisions of a child. It describes of the indescribable loss of a child's death. Moll is a slave. Asa gives her as a maid to Helen upon her tenth birthday. Moll's solace becomes her son Davy. She seeks to protect him from the life of slavery that she has always known. Of the three facets of the story, this is the one that captures me the most. Her relationship with Asa is that of master and slave, but resembles a strained, controlled parent-child relationship. As a slave, Moll has no control over most of her life. The descriptions of her different feelings towards her children hinge on that lack of control. Yet, she find strength and self-determination and love. As Davy charts his own course, the book yet again brings in the forces that pull apart parents and children. "He wonders if fatherhood is easy to men who had fathers." "Fathering had no end. There was no stage at which you could no longer improve." "Little ones are the lights that ease our blackness, a'n't they?" "This is what a mother dreams about at night. She plants herself between these things and her child. She is no defense, but she stands there nonetheless. And that standing is the most protection a man will ever know." The tone of the entire book can be described in two words - isolated and sad. The descriptions of the physical location - although a small town - convey that sense of isolation. Each character seems isolated in their own sorrows. The book is not an easy read, but definitely a worthwhile one and a beautifully written one. Publication Information: Penguin Press. 2014. 304 pages. Favorite Quote: "You know something - you are a man with loss of your making." Ustin "Austin" Voronkov is an immigrant to the United States. In Russia, he trained and worked as an engineer. In the United States, his qualifications are not recognized, and he becomes a factory worker. He falls in love and marries an American citizen. The environment he lives in is the pre-World War I era with its widespread suspicion of all things Russian. For statements made, he is deemed an anarchist. Is he an anarchist? Is he a danger to the country? Is he simply an innocent man caught is an atmosphere of fear? Regardless, he is convicted and deported. He leaves the country with his wife. Over time, his wife and children are allowed to return to the country as American citizens. He is repeatedly denied a visa. He spends years attempting to legally find his way back to his family and back into the country. That is the entire story of this book. The book, which stems from the history of the author's grandfather, grapples with a number of serious issues. What do you do when your adopted homeland shuts you out? What impact do immigration laws and bureaucracy have on individuals and families? What would you do if you thought you would never be reunited with your family? How do you reconcile the fact that even when you follow all the rules, sometimes things still don't work out? This book puts a face to the immigration process - presenting not numbers or statistics or aggregates but the way in which it impacts one man. Unfortunately, the character that the book hinges on is not particularly engaging. The book presents the story through Austin's eyes, who spends the bulk of his life trying to make the system work and waiting for the system to work. Austin spends years and years doing the same thing - working on his "inventions" and hoping that will undo the black mark on his record and allow him a venue back. He has no success. Yet, he tries again and again. Albert Einstein defined insanity as "doing the same thing over and over again and expecting different results." Does Austin's predicament have the effect of driving him insane? Possibly. The book does not clearly state that, but such a situations would exact a heavy toll. The tone of the book certainly presents Austin as removed from the world around him. His constant desire to be somewhere else keeps him from creating a life where he is. He functions, but is forever caught in this struggle which he believes sets him apart from everyone else. The book covers a span of about twenty five years; yet, nothing much really happens. The pace of the book is extremely slow. It is all about Austin; yet, his wife and children suffer through this separation also. Adding their perspective to the book would help create a fuller understanding of the impact of this situation. The ending also is very abrupt and unexpected given the rest of the book. I am left wanting to know what happens after. Are the questions and conflicts resolved? Is there a way to move forward? How does Austin live the rest of his life? How does his family? The concept of this story has enormous potential - to delve into and make the reader feel the ramification of what happens to Austin. The execution just scratches the surface. Just My Typo: From "Sinning with the Choir" to "the Untied States"
Title: Just My Typo: From "Sinning with the Choir" to "the Untied States"
Publication Information: Three Rivers Press, Crown Publishing Group, Random House LLC, Penguin Random House Company. 2012. 192 pages. Favorite Quote: "All typos in this book are intentional. Any typos made by the compiling editor are also intentional, and are there purely for comic effect. If during the course of reading this book you think you spot a typo, you haven't. If you think you might have spotted one all the same, you haven't. No typos will be corrected for future editions." Just My Typo is an eclectic collection of typographical errors found and collected by the editor. The book is relatively short and a quick read, but when you are dealing with a typo in a headline or a sentence, even a short length can encompass a lot. Favorite typos submitted by editors and others. Typesetting mistakes that go well beyond just a typo. "Interludes" with typos or other language trivia that perhaps does not fit the rest of the structure of the book. Some are an interesting historic tidbit, and I found surprising. For example, I learned something about our Declaration of Independence. Some require a little background to figure out the typo. I found myself looking up certain information, but that added to my interest. Some I had to read a couple of times before the error jumped out at me. Of course, once I see it, it becomes obvious. Some tend to repeat time after time in different scenarios. It was interesting to see those patterns emerge. Some are just funny, enough to have me laughing out loud. Sometimes, that alone makes a book worthwhile. I also love finding books that can appeal to children and adults. Parts of this book definitely are sharable with children. I find myself sharing the things I read with my family and around the dinner table. This book is also one that you can read cover to cover, or pick up and put down as you will. You could flip open to any page and find some enjoyment. I really enjoyed it and look forward to additional collections. I also can see myself sharing this with the editors and other lovers of the written word in my life. This book is just my type of book! Disclaimer: Any typos in this review are not intentional. I hope that I have found and corrected them all. If you find any, please let me know. Publication Information: Ballantine Books. 2014. 352 pages. Favorite Quote: "Anyone can be brave for five minutes or an hour or two. The bravery no one talks about is the hardest bravery of all. When you get up in the morning even though you'd rather be dead, that's brave. When you build instead of breaking downs. No one gives you a slap on the back for it, no one tells you your salvation's assured, but it's brave." Issy Bradley is the youngest of the Bradley children. She succumbs to a sudden, virulent illness and dies. This book is the story of those left behind - her father Ian, her mother Claire, her sister Zippy, and her brothers, Alma and Jacob. At the heart of this book is the idea of faith and the role it plays in moving on after a devastating, unexplainable loss such as the death of a child. Ian Bradley is raised in a home driven by faith and serves as a Bishop in his Church. His faith is central to all he does and who he is. He is devastated by the loss of his child, but continues to believe. "One day we'll understand why bad things happen and it'll make sense." Claire joined the Church upon her marriage to Ian. She has doubts and cannot believe that any rationale could explain this catastrophic event in their lives. "Faith in the face of mountainous evidence to the contrary has always felt like a trick or a trap: if she convinces herself to believe, if she manufactures assurance and pus all of her eggs in faith's basket, how much worse off will she be if it breaks?" Zippy is a teenager. She believes in the tenets she has been taught and in the rules of right and wrong. Yet, she struggles with temptations that lie beyond those rules, and with friends who push the boundaries further. Alma wants to be a young man, playing football and hanging out with his friends, without the restrictions that the Church places on him. In his actions, he follows the principles of honesty and truthfulness but struggles with the strict religious rituals. Jacob is a little boy. He believes in miracles with the innocence of a young child. The Bradley family follows the Mormon faith, reflecting the author's own background. Carys Bray was raised in a strict Mormon family, but she left the faith in her early thirties. I know very little about faith, its teachings, or its rules. So, I don't know the accuracy with which the book reflects it. However, as far as the story is concerned, it does not make a difference to me. The rituals and rules presented may accurately or inaccurately reflect the Mormon faith, but the emotions and the journey of faith transcends any given religion. That is where the story lies. How do you deal with such a life altering event? What do you do when "the house is full of sadness. It's packed into crevice and corner like snow." Do you continue to hold onto belief? Do you turn away in sadness and look to blame? Do you hope for a miracle? This book does a beautiful job of exploring those emotions through the perspectives of the Bradley family. What I also really like is that the book does not imply a judgement as to what the right answer is or even if there is a right answer in the author's mind. The ending itself is open to interpretation for there is no one answer. It is an answer that each person must discover for themselves. The book poses the question, and documents different paths. For the questions it poses, I see this as a great book for book clubs. Favorite Quote: "I grow very tired of egalitarian generalizations - all men are not equal, nor are all women. Individualism should be prized." I loved the premise of this novel. Four sisters - two sets of twins - set out in the 1920s to carve their futures as trained nurses. They are to become some of the first specifically trained nurses. Edda wants to be a doctor but settles for nurses' training as that is what is available. Grace wants to get married and raise a family; she goes to nursing to be with her sisters. Tufts wants the independence that knowledge and training will bring. Kitty fights against her own beauty, seeking to be recognized for the person that lies behind the beautiful face. The four sisters, born to the same father but two different mothers, are growing up in 1920s New South Wales, Australia. The nursing training offers a new and acceptable opportunity through which to escape their dominating mother. Maude is mother to Tufts and Kitty, and stepmother to Edda and Grace. Along with the story of the sisters comes the story of the men surrounding them. Jack is the bachelor running his ranch. He is a friend to Edda, but is he more? Dr. Liam Finucan is a physician at the hospital. He is knowledgeable and kind. He too becomes a friend to the sisters. Bear is a traveling salesman whose relationship begins with a chance meeting. Charles is the heir to a local fortune; he is also a physician, whose life up to this point has been spent in England. 1920s and 1930s Australia provide the backdrop to this saga. The weather, the political climate, the economic depression, and the societal role of women all play a role and provide a context to this book. However, the background is not sufficiently developed, just briefly introduced where relevant. This is not an epic book of Australia; it is family saga set there. The focus is definitely not the bigger context. The premise of this book holds such promise - four strong young women seeking change and independence. If romance and relationships come their way, great. If not, the focus remains on their individual journeys and their sisterhood. Unfortunately, the reality of this book leans significantly toward the romance and the relationships rather than the development of these young women. At the end of the day, "there were men's things and women's things; they led on from the manifest differences of anatomy into the realms of the intangible soul." As a result, several of the characters seems one dimensional and undeveloped. For example, early on, the book reveals that Kitty is the sensitive one that the other three protect. We know that this is the result of childhood experiences, but that is all. The reference is repeated several times during the book, but never truly explored. The characters could have been compelling and could have drawn the story together, had they been more fully pictured. A somewhat disappointing development to a promising beginning. Without giving things away, I will say that I was also particularly disappointed in the ending point of two of the sisters' stories. Some of it seemed unbelievable, and some of it disappointing. I wanted and expected the story of women doing great things or at least managing life on their own; what I got was a romance with heroes and villains. Publication Information: Crown Archetype. 2014. 473 pages. Favorite Quote: "Travel is a glorious form of procrastination, allowing us to put off the daily deluge of e-mails, phone messages, and countless burdens with a simple, socially acceptable excuse: 'Sorry, I'm on the road...'"
Here is Where: Discovering America's Great Forgotten History is part travelogue and part history book. It all begins with Andrew Carroll's collection of "forgotten history" - notes he took whenever he encountered "a relatively unknown incident" of history. The place and history must meet his definition of "forgotten." The incident and place must "be nationally significant and represent a larger narrative in American history." I love history, trivia, and travel. This book sounds like the perfect combination! Did you know that Edwin Booth (the brother of John Wilkes Booth) once saved the live of Robert Todd Lincoln (Abraham Lincoln's son) at a train station in New Jersey? Did you know that one of the Japanese pilots in the attack on Pearl Harbor crashed on one of the Hawaiian islands? Did you know that Union Pacific would hire immigrants from diverse backgrounds such that the different cultures and languages would keep the groups separate and make unionization more difficult? Did you know that cartographers sometimes include fictional entries on maps to protect their copyrights - a copied map will have the fictitious entry whereas another cartographer who has done original research would see the fiction? Did you know that on Hart Island in the Bronx is a 101 acre cemetery where New York state buries its unclaimed dead? Each bit of history is presented in a about eight to ten pages. That makes this book easy to pick and put down and read a little bit at a time. As each of the stories is distinct, you can also flip through the table of contents and pick one to read. Even though it is part travelogue, the book does not have to be read beginning to end. The book organizes the events by topic, ranging from coming to America to medical pioneers to stories about the dead. The book has a detailed table of contents, allowing a reader to get to each separate story quickly. The book also includes a list of sources at the end to authenticate the information presented. What would improve this aspect of the book would be an index, a map of the locations, and perhaps illustrations or photographs. Some of the descriptions include references to other similar incidents in history. Unfortunately, these are mentioned in a couple of sentences and not developed. At times, these prove to be a distraction - I either want to get back to the main description, or I want to know more about the reference. As a travelogue, the book is less successful for me. The organization by topic prevents me from getting a sense of Andrew Carroll's journey. It seems to jump from place to place without a sense of continuity throughout. A geographic or chronological organization would lend itself better to understanding his trip. In this setup, I found myself skimming over his personal comments to get back to the historical story he is telling. An entertaining read, but just not what I expected. I would definitely recommend it to the history buffs in my life. Publication Information: Doubleday. 2014. 288 pages. Book Source: I read this book because I enjoy the author's work (The Light in the Ruins, The Night Strangers, The Sandcastle Girls). I haven't liked all the books, but I always seek out the new ones. Favorite Quote: "I was homesick and sad - and you don't know homesick until you think you will never, ever see your home again. But sometimes I think I was at my best when the world seemed to be at its worst." The books explains its title, "Close you eyes, hold hands." The reference is to the school shooting in Newtown Connecticut in 2012. The adults in the school had to walk the surviving students out of the school. Yet, in their path lay the bodies of their fellow students who were killed in the shooting. To prevent the children from witnessing that, the students were instructed, "Close your eyes, hold hands." A powerful reference and image for a powerful book. Vermont is nicknamed the "Green Mountain State" and is known for its rustic and natural beauty and its spectacular fall colors. In this beautiful setting, Chris Bohjalian places the Cape Abenaki nuclear power plant. The term "abenaki" comes from the tribe name of one of the Algonquin Native American tribes of the Northeast. Disaster in the middle of nature's paradise. "The foliage the autumn after Reactor One exploded was phantasmagorically beautiful ... What every understands but no one this about is that the leaves are spectacular because they're dying ... That beautiful red leaf, in other words, is slowly starving to death." This book is Emily Shepard's journal. It is sometimes lost and scattered like her. It is sometimes confused and sad like her. The book acknowledges that as well. "Someday I should rewrite this whole mess. Try to put it in some kind of order. Someday I should probably do lots of things." Emily is a teenager and the daughter of two people who work in the power plant. An accident occurs. One reactor explodes, creating a huge disaster for the plant and a huge surrounding area. Emily's parents die in the explosion, and her father is held responsible for the accident. Emily survives, and she runs. She runs from the disaster. She runs from the notoriety. She runs from the grief. She runs from the shock. That is where the book begins. Shock, grief, and mental illness all play a role in this book. Emily ends up homeless, living on the streets of Burlington, Vermont. "Life on the streets is f***ing exhausting. It really is. There's nothing harder." She ends up alone, until she finds Cameron, a little boy running from abuse at a foster home. That humans connection and feeling of responsibility keeps Emily herself safer and away from destruction. "There were times when I was a totally unfit guardian (I almost wrote "big sister"), but not those nights." Another loss occurs, and Emily runs again. She runs from who she cares about and from people who care about her. "I couldn't do anything right. I didn't belong ... I had betrayed him, and now I was deserting him." The emotion of this book is vivid and evident on every page. As with other recent books with young protagonists and narrators (Land of Love and Drowning and The Goldfinch), I want to reach out and protect Emily. Emily uses bad language. She is self-destructive. She chooses a path of drugs and prostitution at times to survive. Yet, on the flip side, she is intelligent. She spends hours at the library reading. She is passionate about the poetry of Emily Dickinson. She is all of these things together, and she is still a child who has lost all she holds dear in the world. Through all her bad choices and means of survival, I care and wonder who can help her and how. I wish that I could. The book is dark and sad. Emily's has her flaws, and her decisions not always likable. Yet, Emily's character becomes so real through the book that I care deeply about her fate. The best recommendation for the book is that as it ends, my reaction is, "But no. I want to make sure she is going to be okay. What happens to her? What happens next?"